Camp cookware is not the easiest to find in a store. You have to look long and hard to find the right sized cookware to fit inside that compact camper oven. The oven is not very wide or deep. It is made for the bare necessary cooking. Don't get me wrong, it is a convenience, but not one to be ignored. Cast iron is one of the best stove top RV cookware sets I've found. It cooks evenly and is easy to clean. When shopping for a camp ovenware set, you have to remember the size of the oven's interior. It is made as a compact appliance, but works just like your house oven. You have to find ovenware to fit a toaster oven, if you're cooking with appliances. That's the secret to finding the right size. Some RV ovens are made larger than others, so measure twice and order once. Better to be safe than sorry. You want your oven door to shut completely when cooking, so measure depth as well as width. When looking for a place to store it in your RV, the compact size of the camping cookware will easily fit in any cabinet. You can even store it right in the oven. Another thing to think about is the utensils to cook with. With limited drawer space and counter space, you just don't need a lot of stuff sitting around. Putting all your cooking tools in a tall organizer will keep them out of your much needed drawer space and will not take up much room on the counter top. Yes, I said tools. Every good chef needs a great set of tools. You work hard at cooking and BBQing, so you need the right tools for the job! When purchasing your cooking tools, be sure you get the ones that are high temperature rated. 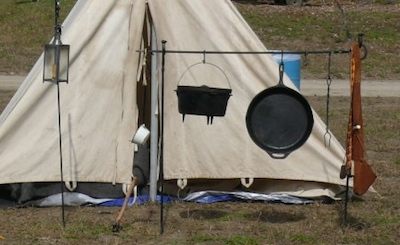 You will want to be able to use them outside over an open fire, as well as in the camp kitchen. Your camping cookware may or may not be suitable for campfire cooking. Cast iron is usually ok. Check your manufacturers recommendation before you stick it over a fire.